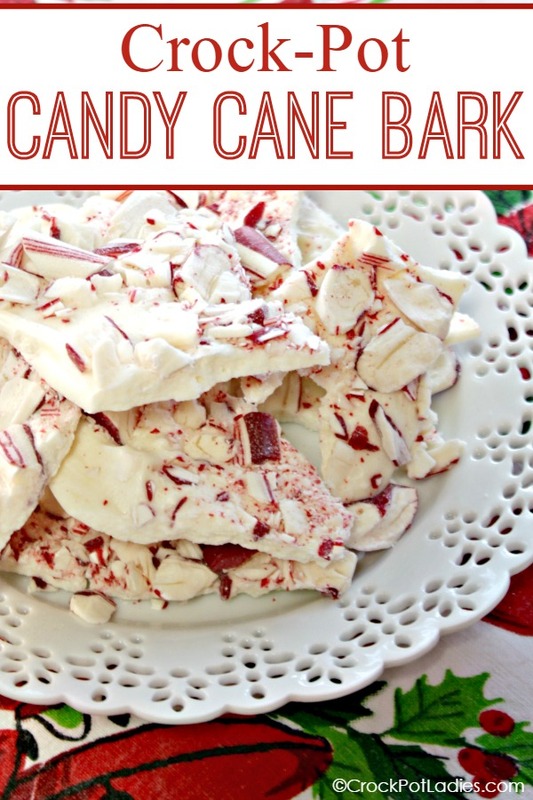 Making holiday candy couldn’t be easier with this simple recipe for Crock-Pot Candy Cane Bark. With just two ingredients you can have a fun & festive holiday treat that is perfect for gift giving! Are you looking for a quick and easy (and yummy) treat to make for the holidays? 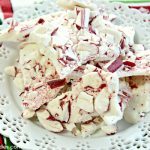 Then you MUST try this Crock-Pot Candy Cane Bark recipe. Candy bark is so easy to make (and made even easier when you use your crock-pot to help melt the white chocolate) and makes a great gift to give at the holidays too. Just package it up in some cute Christmas tins or cellophane bags and you have a great gift perfect for friends, family, neighbors, co-worker or the teachers at your children’s school! With only 2 ingredients you can have this fabulous candy recipe done in no time! Just two ingredients in this easy to make holiday candy recipe. Perfect for snacking or gift giving! Put one gallon sized zippered plastic bag inside another one gallon zippered plastic bag so that you have a double bag arrangement going on. Place the peppermint candy canes in the doubled zippered plastic bags and zip the bags closed removing most of the air. With a rubber mallet, hammer or the end of a rolling pin crush the candy canes until you have a nice mixture of small chunks and candy cane dust. Pour both bags of white chocolate chips into the crock of a 3 quart or larger crock-pot. Line with a crock-pot liner if desired but do not spray the crock-pot with non-stick cooking spray. Cover and cook on LOW for about 1 hour until the chips are melted enough that when stirred they turn smooth. Be careful not to overcook as the white chocolate chips will burn. In the meantime line 1 large rimmed cookie sheet with waxed paper or parchment paper. Pour half of the crushed candy canes into the melted white chocolate and stir until well mixed and candy canes are covered with melted white chocolate. Pour melted white chocolate and candy cane mixture into center of prepared cookie sheet. Working quickly, spread candy mixture evenly on cookie sheet with and offset spatula making sure that there are no overly thick or thin areas. Sprinkle remaining candy cane pieces evenly over the top of the candy cane bark. Let candy harden at room temperature for a couple of hours (you can speed up this process by placing cookie sheet in the refrigerator). Flip candy bark out of cookie sheet and peel off the wax paper and break bark into pieces. Store in an air tight bag, container or package for gift giving. You may also use a food processor to crush to candy canes, just be careful not to over process otherwise you will end up with candy cane dust with very little chunks. The past few times I have been to the grocery store, I have seen bags of already crushed candy canes!!!! What a wonderful time saver and less of a mess! So the crock pot is just used for melting the white chocolate. Seems a little silly and not energy-efficient. 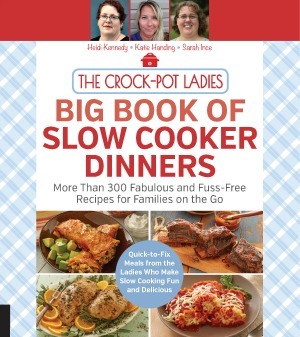 The crockpot actually uses less energy then the microwave or the stove. I liked it because I didn’t have to baby sit it unlike the microwave (which you will burn it if you don’t watch it like a hawk. I’ve done it both ways, and both ways work. There are different size boxes of candy canes and bags of white chocolate depending on store. Could you list the amount of both ingredients? I only suggest using Nestle white chocolate because they are the only ones that melt properly. They white only come in one size. You want the regular sized candy canes (so not the super small or the huge ones)….they are about .5 ounce each. You can use the smaller or larger you would just need too use either a whole lot more or a whole lot less. Just eye ball it…you don’t want it too chunky or not enough crunchy. It’s really not an exact science. How long can you store the bark? Could I make this a couple weeks before Christmas and store away for gifts? You can store the bark in an air tight container or bag in a cool place. And it can be stored just fine for 4 – 6 weeks if you can resist snacking on it!